More than five years after Congress directed the Executive Branch to change the way small business contract performance requirements are calculated, the U.S. Department of Defense (DoD) and the Federal Acquisition Regulation (FAR) Council announced significant steps yesterday to adopt these new requirements. By way of background, in June 2016, the U.S. Small Business Administration (SBA) issued a final rule changing its regulations regarding the limitations on subcontracting applicable to small business set-aside contracts. SBA’s amended regulations were promulgated in response to a directive in the 2013 National Defense Authorization Act (2013 NDAA) which required changes to how limitations on subcontracting requirements are quantified and which required inclusion of “Similarly Situated Entities” (SSEs) in the prime contractor’s portion of the work under set-aside contracts. The contracting community has been anxiously awaiting an amendment to the FAR, which has been asserted to be necessary for these Congressionally-mandated changes to become effective. On Dec. 5th, the DoD issued a Class Deviation which adopts SBA’s current approach to Limitations on Subcontracting. The Class Deviation is effective immediately and applies to all DoD solicitations and contract awards from that date forward. 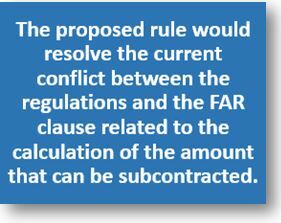 DoD’s Class Deviation was issued in conjunction with a notice of proposed rule-making issued by the FAR Council, which proposes to amend the FAR’s Limitations on Subcontracting clause (52.219-14) to conform with the statutory requirement and SBA’s previously announced final rule. It’s been more than a year since the SBA issued a final rule overhauling the limitations on subcontracting for small business contracts. The SBA’s rule, now codified at 13 C.F.R. 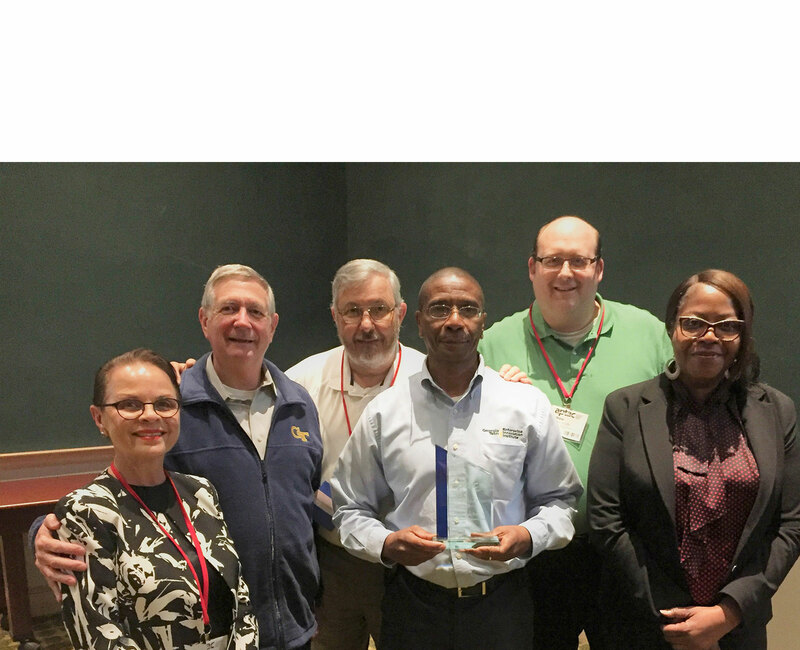 125.6, changes the formulas for calculating compliance with the limitations on subcontracting, and allows small businesses to take credit for work performed by similarly situated subcontractors. 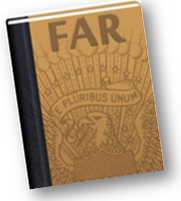 But the FAR’s corresponding clauses have yet to be changed, and this has led to a lot of confusion about which rule applies – especially since many contracting officers abide by the legally-dubious proposition that “if it ain’t in the FAR, it doesn’t count.” Now, finally, there is some good news: the FAR Council is moving forward with a proposed rule to align the FAR with the SBA’s regulations. Before deciding whether to set-aside a solicitation for small businesses under FAR 19.502-2, should the contracting officer first determine whether those small business will be able to provide the needed services while, at the same time, complying with the limitation on subcontracting? No, according to a recent Government Accountability Office (GAO) bid protest decision. Instead, an agency’s determination whether a small business will comply with the limitation on subcontracting should be made as part of its award decision (following the evaluation of proposals), not during its initial set-aside determination. Under FAR 19.502-2(b), a procurement with an anticipated dollar amount greater than $150,000 must be set-aside for small businesses where there is a reasonable expectation that offers will be received from at least two responsible small businesses and that award will be made at fair market prices. Though orders under Federal Supply Schedule (FSS) contracts (issued under FAR part 8.4) are exempt from these small business programs, a contracting officer nonetheless has discretion to set-aside FSS orders for small businesses. The Small Business Administration issued a proposed rule that would let two or more small businesses join together to bid on single small business contracts, a Dec. 29, 2014 Federal Register notice says. The proposed rule comes as part of an update in the 2013 National Defense Authorization Act that changed some provisions in the Small Business Act. “SBA proposes to remove the restriction on the type of contract for which small businesses may joint venture without being affiliated for size determination purposes,” the proposed rule says. SBA says it’s proposing the change because it would encourage more small business joint venturing and would help agencies meet goals for small business participation in federal contracting. Compliance with the limitations on subcontracting are not adequately being monitored by the contracting officers responsible for 8(a) contracts, according to a recent GAO report. After reviewing a representative sample of ten 8(a) contracts, the GAO determined that contracting officers effectively monitored subcontracting limit compliance on two of those contracts. In other cases, agency contracting officers failed to effectively monitor compliance, even in situations presenting a heightened risk of potential violations–such as where ineligible incumbents were serving as subcontractors. 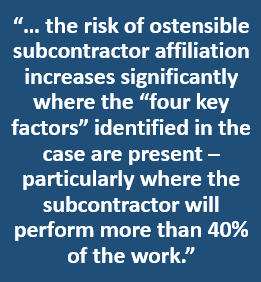 Under the FAR’s limitations on subcontracting clause, the work to be performed by a 1099 independent contractor did not count toward the prime contractor’s performance. In a recent bid protest decision, the GAO held that a procuring agency properly rejected an offeror’s proposal because the offeror was relying, in part, on an independent contractor to meet its obligations under the limitations on subcontracting clause. The GAO’s decision in MindPoint Group, LLC, B-409562 (May 8, 2014) involved a Department of Justice solicitation for information technology infrastructure support. The proposal was issued as a set-aside for Economically Disadvantaged Woman Owned Small Businesses (EDWOSBs), and incorporated FAR 52.219-14, the standard limitation on subcontracting clause. For a services contract, FAR 52.219-14 requires the EDWOSB to perform at least 50 percent of the cost of contract performance incurred for personnel with its own employees.